What is it like, you ask, to live in a 3rd world country with 2 small children? Our days begin with little birds chirping or little children chirping. Whichever wakes up first. We get up, change out of diapers (oh how happy we will be when the children are night trained) and put on undies. Except for those of us already in undies. Breakfast is usually simple. Anything from homemade granola, pancakes, oatmeal or sometimes eggs and potatoes or biscuits and gravy. Everything is from scratch except for the mornings Cheerios are on the table. Bless those Cheerios. After breakfast, it's dishes (when I'm on top of things, otherwise this item happens after lunch), laundry (we are blessed with a washing machine and hang our clothes under the house), filling our 450-gallon water barrel, clean up toys, do the morning house sweep, shower and dress, and start bread. About this time, Todd gets ready to sojourn out to the airport to continue the maintenance and inspection he's doing on the plane, or goes into town for any business that needs to be done. I spend some time getting ready for preschool, planning out any crafts, table work, games, etc. that we might want to do that day that's not already planned. Around 9:00 Joy, the other pilot's wife comes, with her 2 girls and we start school. I thought I would homeschool because I'm a missionary wife and by golly that's what missionary wives are supposed to do. But it's kinda neat, it's almost a ministry in itself. I like that. We start with floor time, we sing, pray, look at the calendar and weather, and have a Bible story. Then we might do something special like play ABC bingo, or some other activity. Then we divide and conquer. Joy works with the older ones (her oldest and Amelia) on their lessons and I take the younger two. When lessons are done, we eat lunch together and then say goodbye to the girls. Then it's nap time for Samuel and Amelia and quiet time for Mama. I have my devotion time, do the dishes, the afternoon sweep and any other cleaning that needs to be done, prepare for school the next day, and begin supper. After the kids are up, we have play time and reading time. The kids play outside when it's not raining too hard (it's rainy season right now). Todd gets home around 6 most days and we eat supper shortly after. Anything from burritos on homemade tortillas, pumpkin curry on rice, to homemade pizza. After supper is family time, bath time, worship time, and finally, bedtime for the small people. After they're down, Todd and I finish work we're doing, clean up, play games or simply sit and talk together. Our days don't seem too different from days in the US, only here we loose power for a few minutes to a few hours most days. Sometimes it's brief and other days it's off all day from morning until into the night. 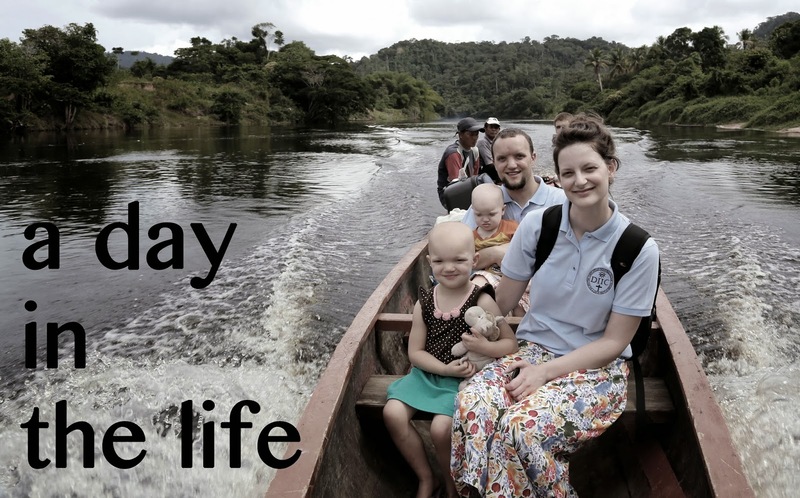 And that's a day in the life of missionaries in Guyana.